In changing over to (or originally building) a junk rig, one of the questions that needs to be resolved is how all those many lines will run to and from the top of the mast, or masts. Sorting out a plan, and then implementing it, has been a process. The most common approach seems to be having a special cap, with an array of attachment points, either cast or fabricated. Some Wharram catamarans deal with masthead attachments using two horizontal rods, one above the other, at 90° to one another, which make places for either lashings or loops tied around the mast to catch and avoid slipping down. 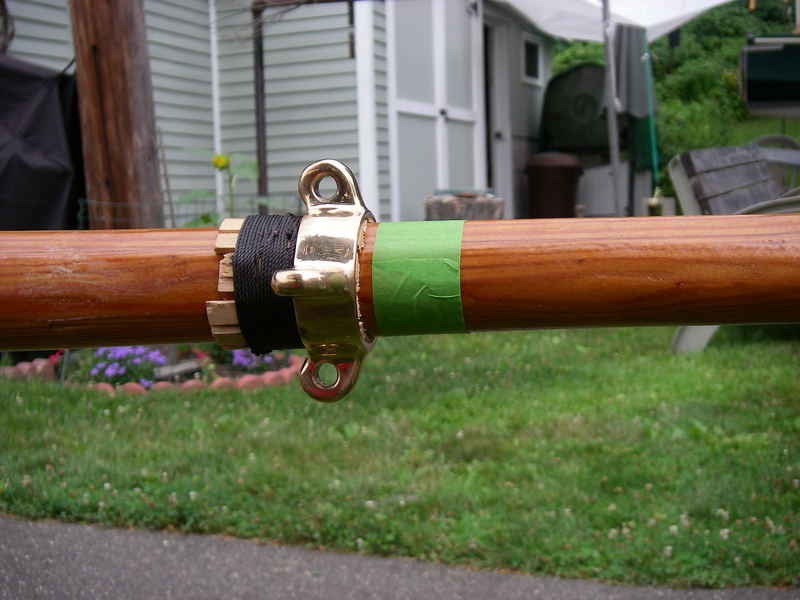 Another alternative is a small eye strap screwed to the mast at the backside of each lashing; the lashing is supported sturdily around the mast, and is prevented from sliding down toward the deck by the eyestrap. I’m partial to the methods that avoid putting substantial holes through the mast… In the previous AUKLET rig, that last method with the eye straps is what I did for the halyards, and it worked well. The tricky thing about a junk rig is how very many lines need to be connected to the top of the mast. Some folks still do it with lashing, and that was my fallback plan, but I was hoping for something more like a proper fitting. At the same time, I was not excited about trying to sort out the fabrication process (welder? foundry? galvanizing?? ), and there was some question about the appropriate diameter for the fittings for the two masts anyway; waiting for that clarification meant that fabrication could not be started decently ahead of time. Considerations on the diameter question have been that the original wood mizzen mast, which we are still using, is taller than needed for the halyard and other lines for the junk sail, but I have wanted to keep that extra height (flags! ), and the mainmast that we had been using really needed to be changed out. As a result, there were questions until very recently about the mast fitting diameters. As far as I know, there is no place to get stock, already made junk rig masthead fittings. Standard mastbands with four eyes are pretty close to the typical five attachment points of a custom junk rig masthead fitting. With an extra line looped around the mast immediately above the fitting, prevented from sliding down by the fitting itself, I think it’ll work out fine. (This looped line will be the “mast lift,” for those who follow junk rigs more closely.) The mastband will be oriented so that the eyes are positioned on the 45° diagonals, relative to the centerline of the boat – this way one of the eyes will be at the appropriate angle for the halyard, which is the highest stress line that hauls the sail up, and for a junk rig is supposed to be at that 45° angle, somewhat off to the side. The next questions are the particular choices, and how these mastbands will actually be secured to their respective masts. 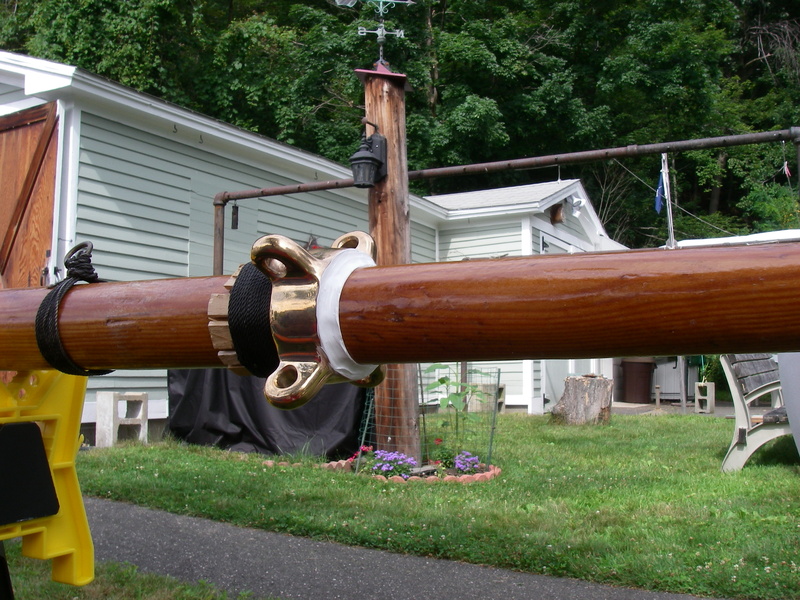 There’s a bronze band for the wooden mizzen, and a galvanized one for the aluminum mainmast. Bronze hardware and aluminum masts do not fare well together, so it’s galvanized there, and bonus, it’s more economical – but the bronze is very pretty, and I sprung for that for the smaller mizzen. 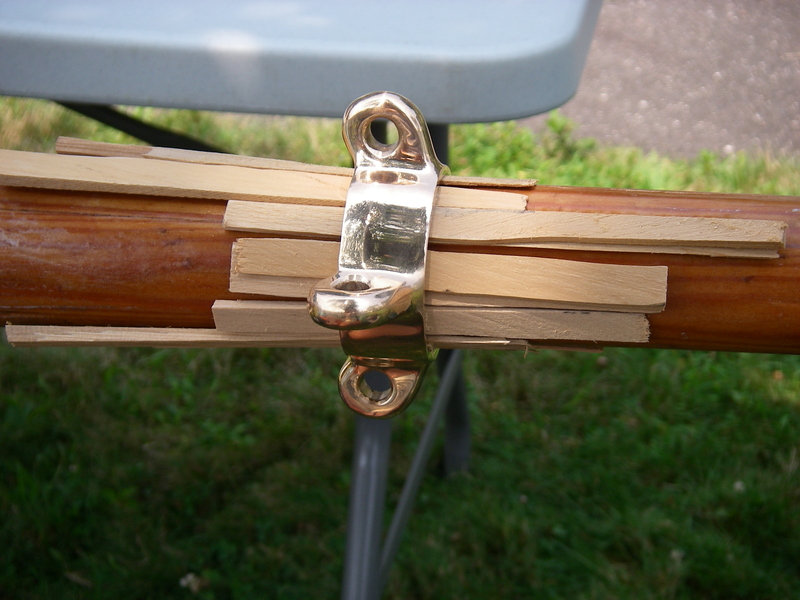 On a wood mast, typically there is either a small shelf carved into the mast for the band to rest on, or small wood stops are screwed to the mast, to prevent the band from working its way down. Neither option seemed particularly exciting, because of compromising the already small-diameter wood, and as it turned out the position that would be ideal for the band is above where the band that we have would rest naturally, and below where the next smaller size would fit. 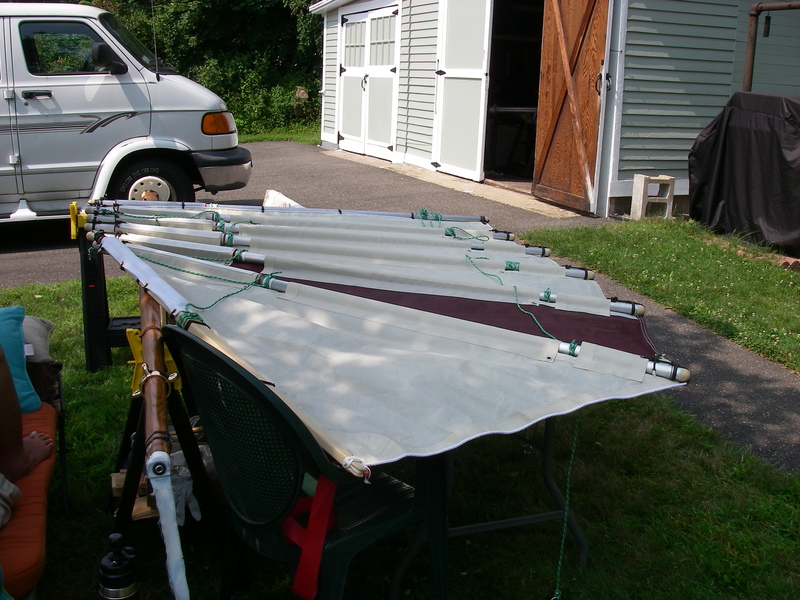 Here’s a photo of the mizzen sail laid on top of the mast, to help figure out the mastband placement (really, the sail goes on the other side of the mast). It’s important that when the sail is raised, the halyard attachment is a decent amount higher than where the halyard is tied to the yard. This is because of potential torque on the top of the mast when the sail is out to the side. Having a length of extra halyard between the masthead fitting and the yard prevents that torque – and potential mast damage – from happening. Because the ideal position for the mizzen mastband is halfway between the two available band sizes, we have yet another experiment: securing the mastband is being done with small wedges made from cedar shingles, jammed up from the bottom, with top ones going down over the bottom ones wherever there are gaps. The lower wedges are seized in place with tarred nylon seine twine and trimmed, and the top ones are trimmed flush with the band and then caulked to prevent water coming in from the top. I would’ve liked to have used dolfinite in this process – mast rot can be an issue, with everything so tight against the mast – but it seemed like it would be a hopeless mess to try to get dolfinite in there with all those shifting wedges and adjustment. So the theory here is that the caulk will prevent endless drenching from above, and the gaps between the cedar wedges will allow for drying from below. We’re hoping for the best on this, and will be paying attention to how it fares. The white caulk is a bit glaring now, but probably next year it will be time to paint the mast, and the upper part will be the traditional white, so it should all blend in. Fitting the mastband to the tapered aluminum mainmast presented two problems: one, the mastband was not perfectly circular, so it rocked when placed on the mast. Additionally, because of the difference in taper between the mast and the inside of the band, there was a substantial gap all around the upper section of where the band would otherwise be meeting the mast. This contributed further to the rocking. We decided to apply dynel fabric and epoxy to this situation. Dynel is nicer to work with than fiberglass – no splinters in your skin, and the fabric holds together a little better than fiberglass cloth when you’re working with it; otherwise it’s the same idea. 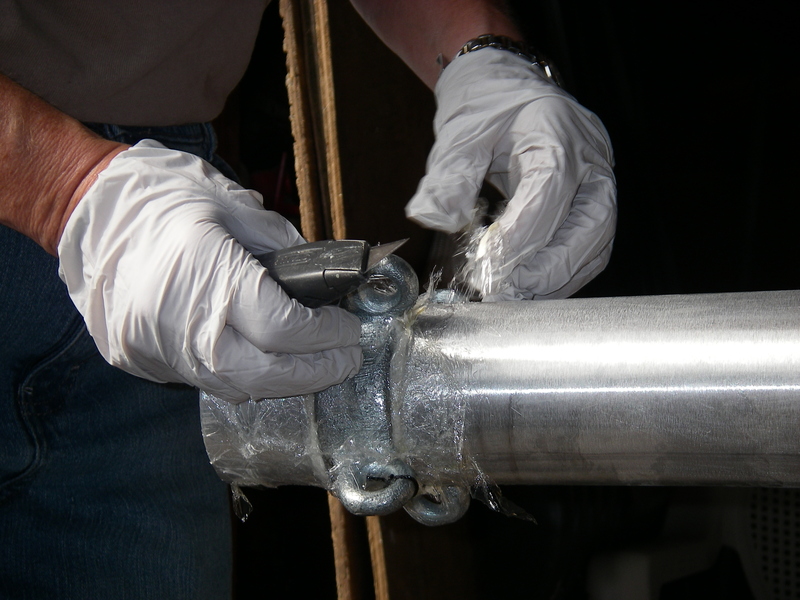 The theory was to get one layer of dynel around the mast, extending above and below the band, and then to scrunch the epoxy-wetted fabric into the gaps, as well as creating a small roll below the fitting, to give the fitting something secure to rest against. 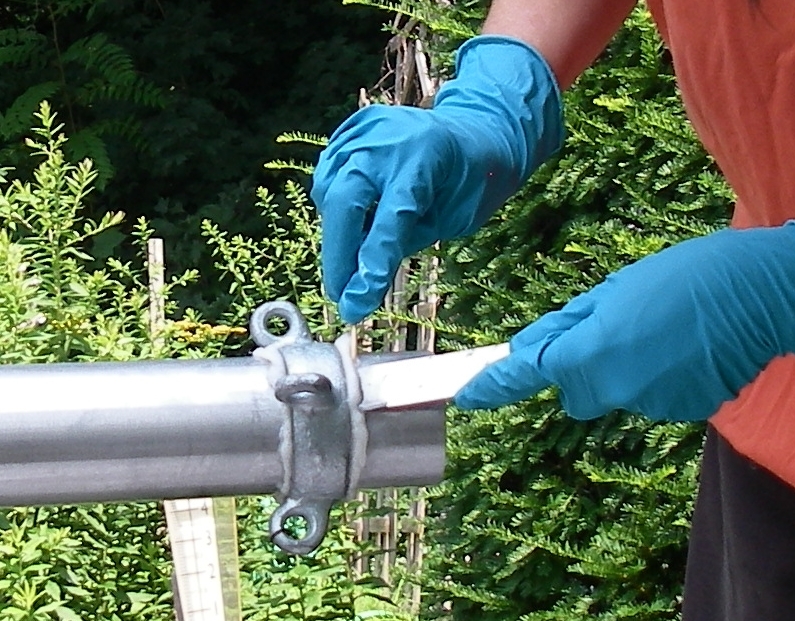 An added advantage to this arrangement is that the aluminum and galvanized steel are electrically isolated from one another. Although these two metals are supposedly fairly compatible, it’s relaxing to know that there will be no galvanic corrosion to worry about. In the end, rather than wrapping one piece of dynel around the mast, it was easier to cut pieces of dynel to fit around the mastband, dry, with temporary masking tape on the outside, and then to put epoxy on the inside section, and slide the whole thing onto the (previously scuffed) mast. 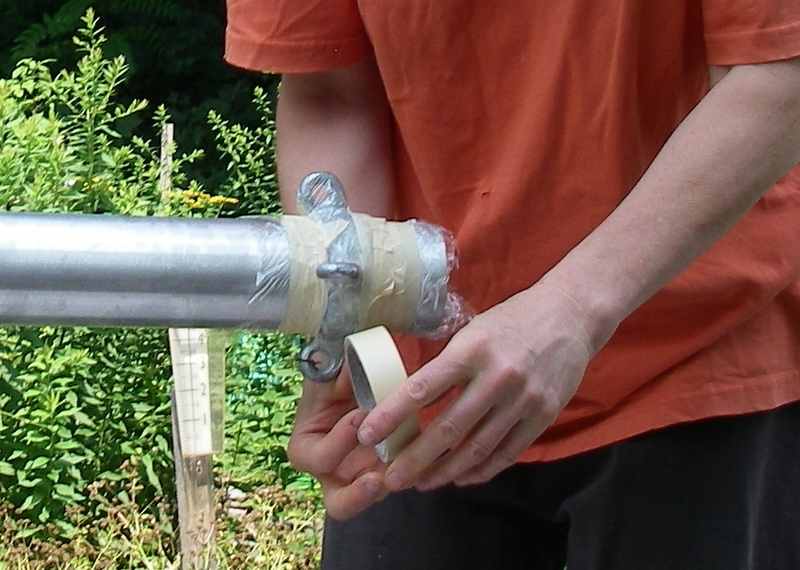 After this, the masking tape was gently pulled off and the dynel stretched out above and below the band. Once stretched out, epoxy went on all of the remaining fabric, and then the fabric was delicately folded back toward the ring. 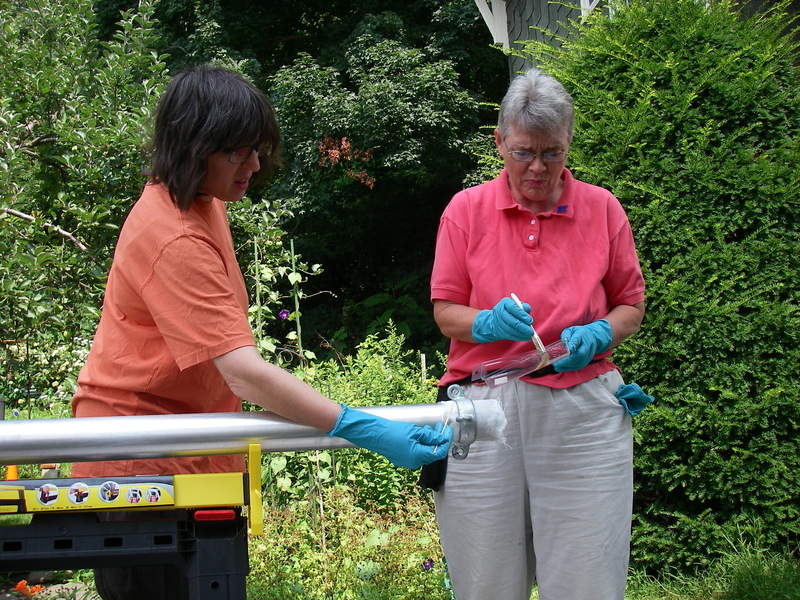 Theo had a handy thin stick in one hand, and a narrow putty knife in the other, and with Suzanne taking care of brushing the epoxy onto the fabric it all worked pretty well. Theo used the little stick to help spread the epoxy and work it into the fabric, and then to help with rolling and tucking the whole business into place. The only complication was that once the dynel was all folded and stuffed, it had a kind of puffy thing going on, and declined to stay scrunched into one solid lump. 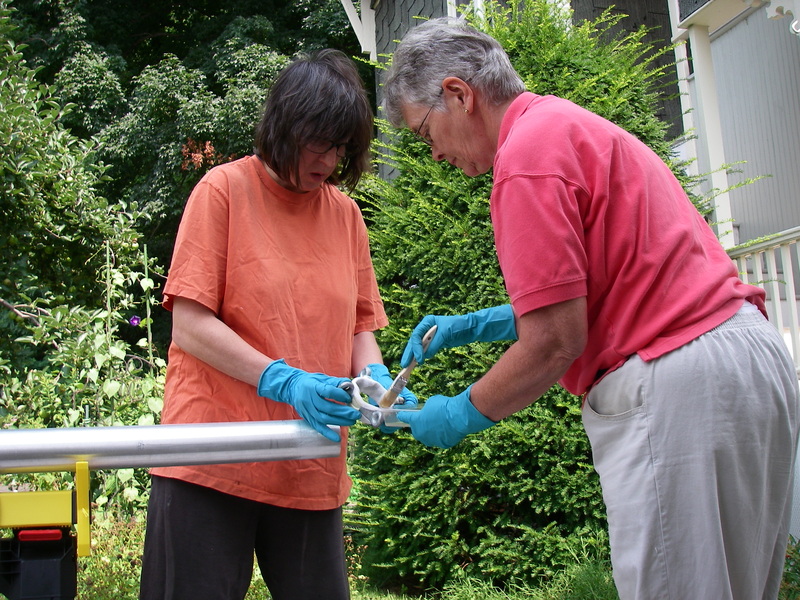 We ended up wrapping the whole business in Saran wrap, and then applying masking tape to press the dynel snugly against itself and the mast/mastband joint. This arrangement worked out fine, except for that the Saran wrap was not exactly ideal when it came to later getting it off the hardened epoxy. It did do a good job of preventing the masking tape from being glued into the dynel/epoxy, but my dreams of the plastic wrap neatly peeling off were quite far from the truth! Still, when we took it all off the next day, and spent about an hour of fussy removal of small broken pieces of plastic wrap, it came out pretty good. Sandpaper is next, after the full week of curing (epoxy dust is quite toxic before it’s fully cured), and then the whole thing should clean up just fine. The dynel/epoxy will be painted later, to protect it from uv. So now there are two mast bands in place! Each of them feels quite solid and secure, and presently we’re working on mounting the brackets for the tricolor light and AIS antenna at the top of the mainmast. It’s going to be fun to start attaching lines! 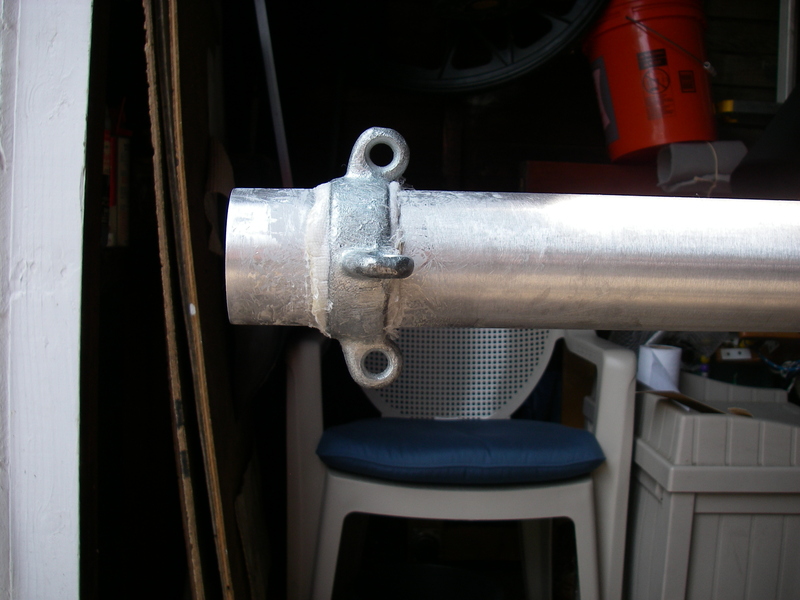 I used a galvanised version of the mast rong you are using on Applecross. It sort of works. However, I am getting snagging between the top of the lazy jacks and the halyard. I am thinking for next yeat to put a horizontal bar across the mast head that will allow me to put the lazyjack blocks further out. Practical Junk Rig talks about with aluminum masts an eye strap can be attached on the forward side of the mast, somewhat down from the height of the halyard attachment, so the lazy jacks can be tied around the mast there (diagram page 136). Maybe that helps with that problem also. We didn’t go for the individually attached fittings, but perhaps that would be one of the advantages of doing things that way, if one has an aluminum mast anyway.